Edmund Gerald "Jerry" Brown, Jr. is an American politician. 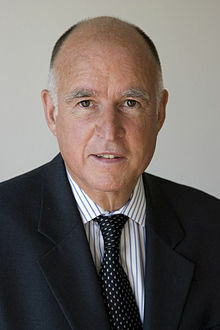 Brown served as the 34th Governor of California (1975�83), and is currently serving as the 39th California Governor (2011�present). He is the son of Pat Brown, the 32nd Governor of California (1959�67). Both before and after his first two terms as governor, Brown was elected to a number of state, local and party offices. Brown previously served as a member of the Los Angeles Community College District Board of Trustees (1969�1971), Secretary of State of California (1971�1975), chairman of the California Democratic Party (1989�1991), Mayor of Oakland (1999�2007) and Attorney General of California (2007�2011). Brown sought the Democratic nominations for President of the United States in 1976, 1980, and 1992, and was the Democratic candidate for the United States Senate in California in 1982 but was unsuccessful in these attempts.